Lesser known fact, in Germany they serve potato salad one of two ways. If you live in the northern part, it will have mayo (similar to here in America), but if you’re in the southern region it will not. So in honor of my German heritage I’m preparing it MY favorite way..the southern! 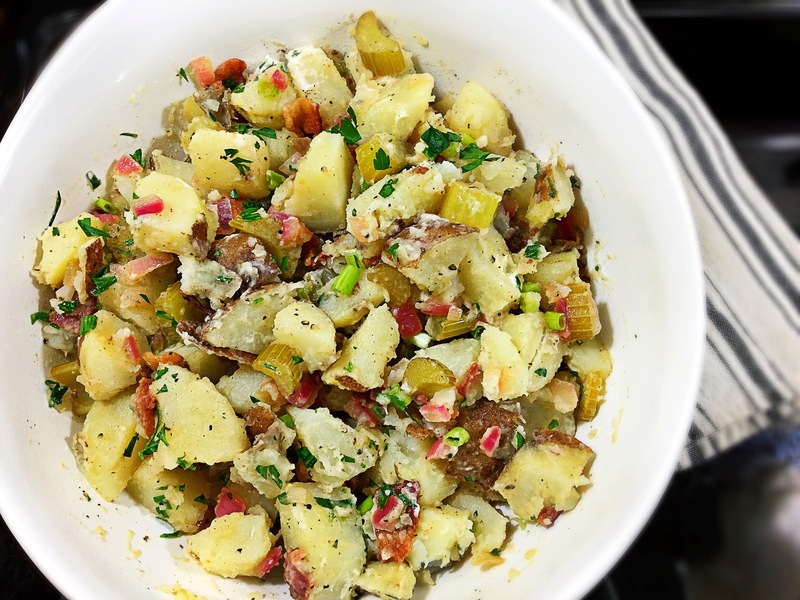 Now we grew up with this side dish staple at, I’d say, every single family get together ever, of all time, of eternity…and it was then and now always a hit with us and the newbies to try it. However, much to my mom, aunts, grandmas and great-grandmas dismay I steered away from the northernn variety due to my distaste for mayo. 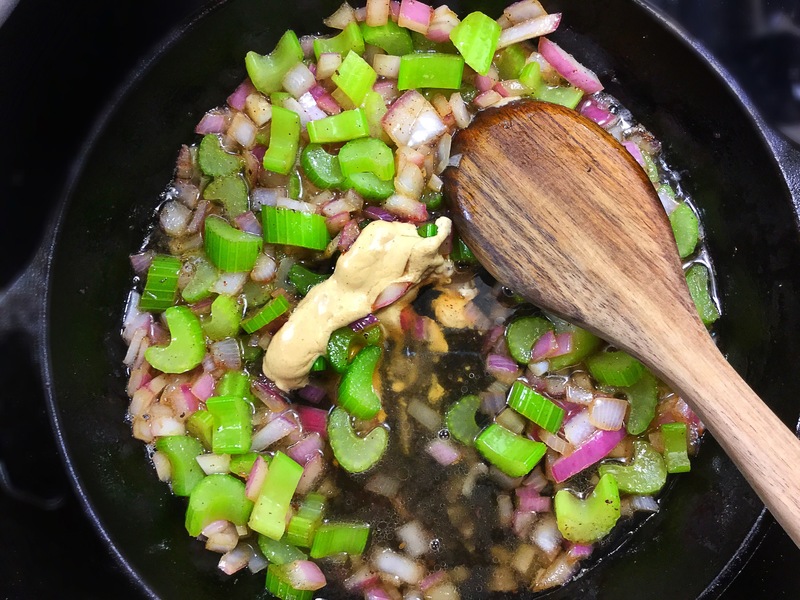 Given I love bacon, cider vinegar and mustard, this authentic style fits the bill for me! *This is fantastic for a warm day grill-out with the family, as it has no mayo and won’t spoil nearly as fast! *You can add a 1/2-1 cup of mayonnaise if you just MUST have it that way 😉 It will still be just delicious and no need to tweak anything else! You’ll just be eating northern Germany style! In a large stockpot, add in the scrubbed potatoes (I like to quarter mine for faster cooking/no need to peel) and cover 1-inch over with water. Add a liberal amount of salt and bring to a boil. Once the water is boiling, cover and reduce the heat a bit and let sit for roughly 20 minutes, until just fork tender. Drain and set aside to cool slightly. Once cool enough to touch, the skins will easily come off and chop the potoes into bite size chunks. *Personally, I like just a tad bit of the skins still. 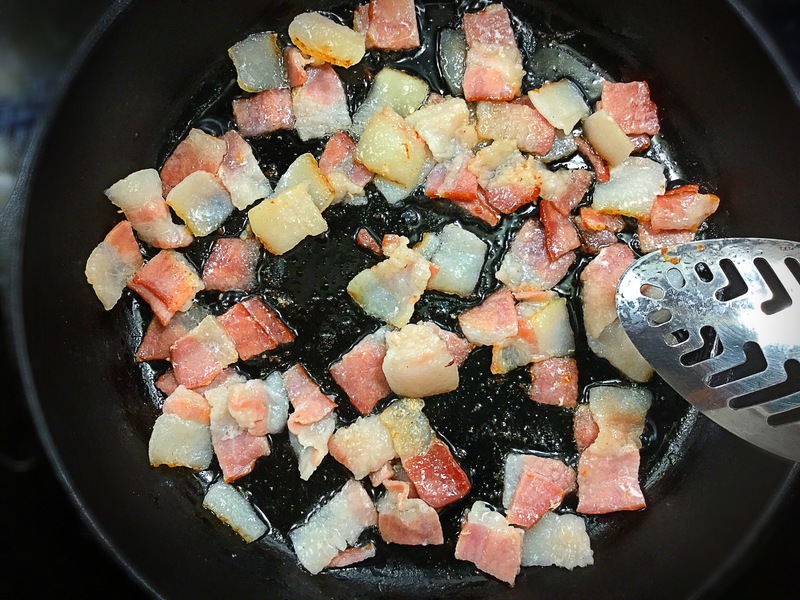 Meanwhile, chop up the bacon and place in a pan, cook till crispy. With a slotted spoon, transfer the bacon (when done to your likeness) to the bowl of warm potatoes. You want all that glorious bacon grease to remain! 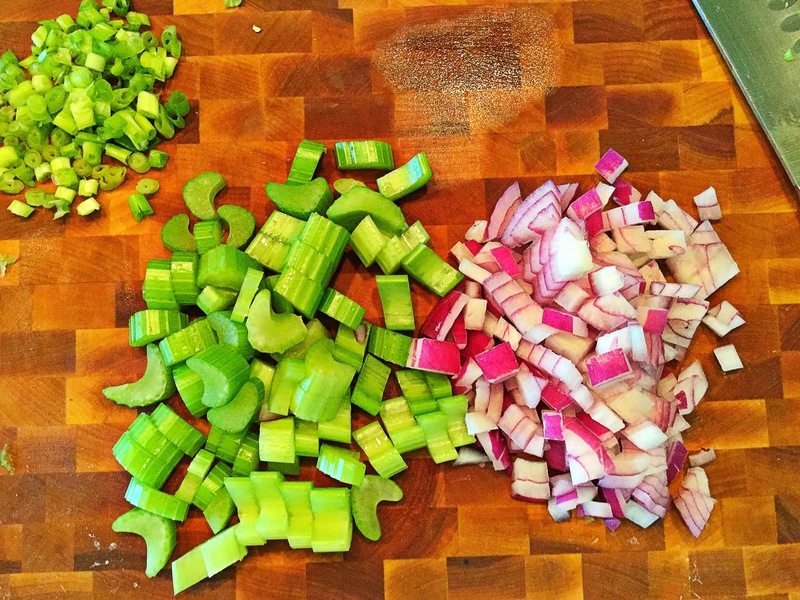 While the bacon is cooking is when you can chop up the veggies. 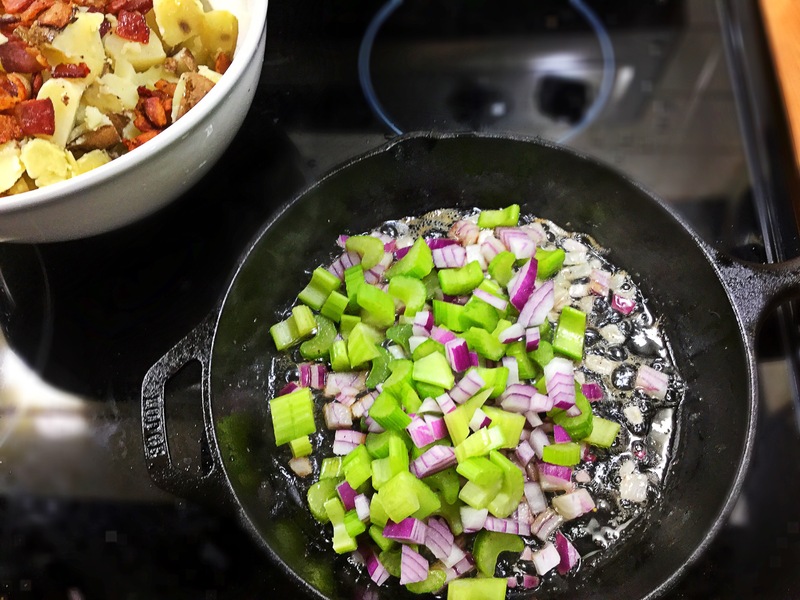 Transfer the sliced and diced up celery and red onion the the hot bacon grease and saute for 3-4 minutes. 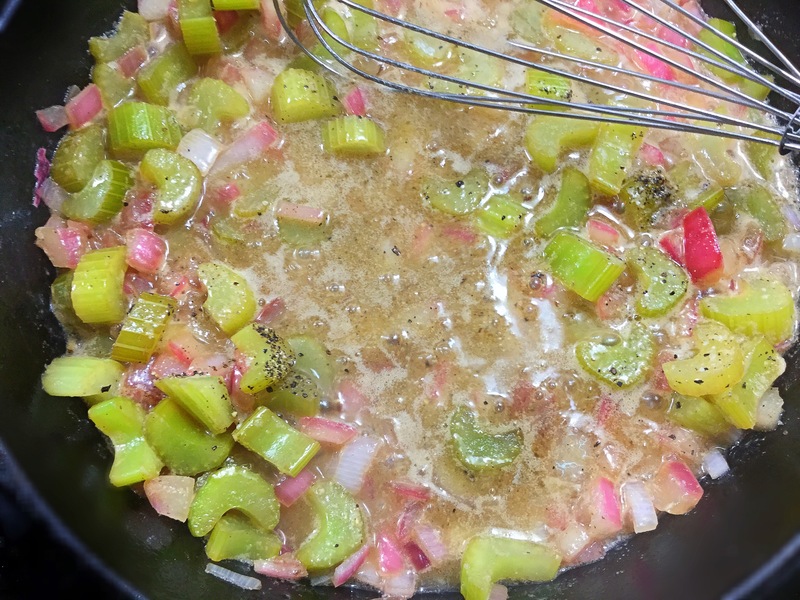 Once softened, add in the apple cider vinegar and dijon mustard and cook for 2-3 more minutes. Finally, whisk in the olive oil and season with the salt and pepper. 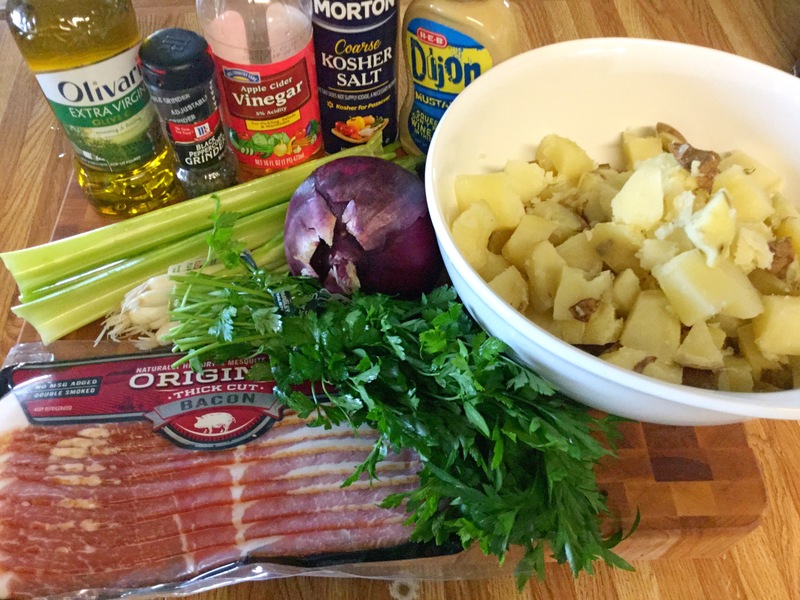 Pour this hot dressing directly over the warm potatoes and cooked bacon pieces. Toss together careful not to smush the potatoes too much. Lastly, fold in the green onion, parsely and season again with a bit more kosher salt & ground pepper to taste. (remember potatoes can benefit from salt). Enjoy friends!